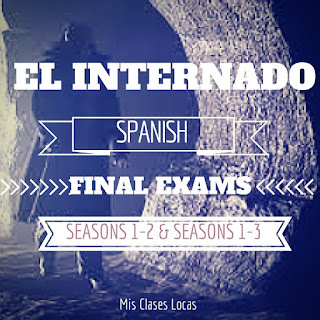 For those of you who were interested in an exam over El Internado season 1, here it is! El Internado Final Exam - Season 1. Last week I shared a post on my final exam for seasons 1-2 & seasons 1-3. Once again I would have gladly shared it for everyone to use, but I did not want the answer keys out there for students to find. This exam was originally made in Google forms for flubaroo, so it includes more specific answers than most assessments I do. 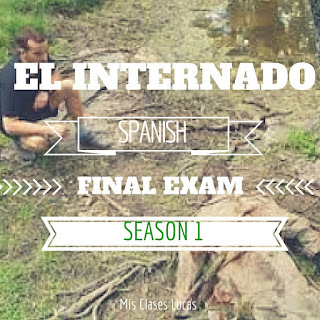 Give this exam if your students have watched season 1 (the first 6 episodes) of El Internado: Laguna Negra. This exam includes a mix of 45 multiple choice, true-false & fill in the blank questions over season 1. There are character identification, who said it, place identification with pictures, and major plot points included. There is also a writing prompt to be completed in Spanish. In addition I usually do an interpersonal assessment as well, where students must talk in pairs about both El Internado and the books we have read this year. Since I finally added a few things to Teachers Pay Teachers for the first time since SUMMER, I decided it was time for a little end of the year sale! This Tuesday & Wednesday (May 3 & 4) my entire TPT Store will be 20% off! Use the code CELEBRATE at checkout! This is your chance to get some end of the year activities to spice it up and finally grab some items that have been hanging out in your wish list. Remember, that if you review items you have purchased on TPT, you get points that can be spent like money. 20 points equals $1! Here are my newest additions to check out. So, do not forget to go shopping this Tuesday & Wednesday (May 3&4)! To finish the year, Spanish 4 is reading the novel La Calaca Alegre by Carrie Toth. 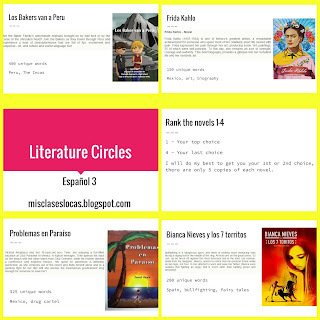 I already posted about teaching chapters 1-5 and here are all posts with the label La Calaca Alegre. We reviewed chapters 1-5 from the week before using the fun marker partner game from Cynthia Hitz. I read true/false statements from the first 5 chapters & students have goofy rules to show their comprehension. Students read chapter 6 and we discussed it as a class. We used the videos from the teacher's guide to do a video tour of the neighborhood of Pilsen in Chicago. We used the phrase "meterse en líos" to talk about students past history of getting in trouble using an activity from the teacher's guide. We read and discussed the chapter. We reviewed the conditional tense and students did a guided writing on what their reaction to Carlos would be in they were his aunt and uncle. Students shared their free writes from the day before with their tables, reviewing and discussing once again what they would have done it that situation. Per the class request, i read the chapter to them, and we discussed as we went. Students then wrote and discussed their prediction of what would happen in the second half of the book. We discussed predictions as a class and then read and discussed chapter 9. Students completed a web quest from the teacher's guide about Jeff Zimmerman murals. We went through the Murales de Pilsen slideshow from the teacher's guide. We started this chapter after a long weekend, so I divided up the 9 chapters we had read so far. My nine students were each given a piece of computer paper and were responsible for drawing and writing what happened in their chapter. These were then posted around the room in a gallery walk style, so students could walk through what had happened so far. Before reading we discussed the phrase "meter la pata," using times we had put our foot in our mouth.We read and discussed the chapter. Students completed phrases from the starter "If I were Carlos," once again focusing on using the conditional. Hopefully by next week I will be able to post Teaching La Calaca Alegre - Chapters 11-15 once we finish the book! This year my Spanish III & IV final exams will be heavily based on the TV show El Internado: Laguna Negra, which they have been watching all year on Fridays. 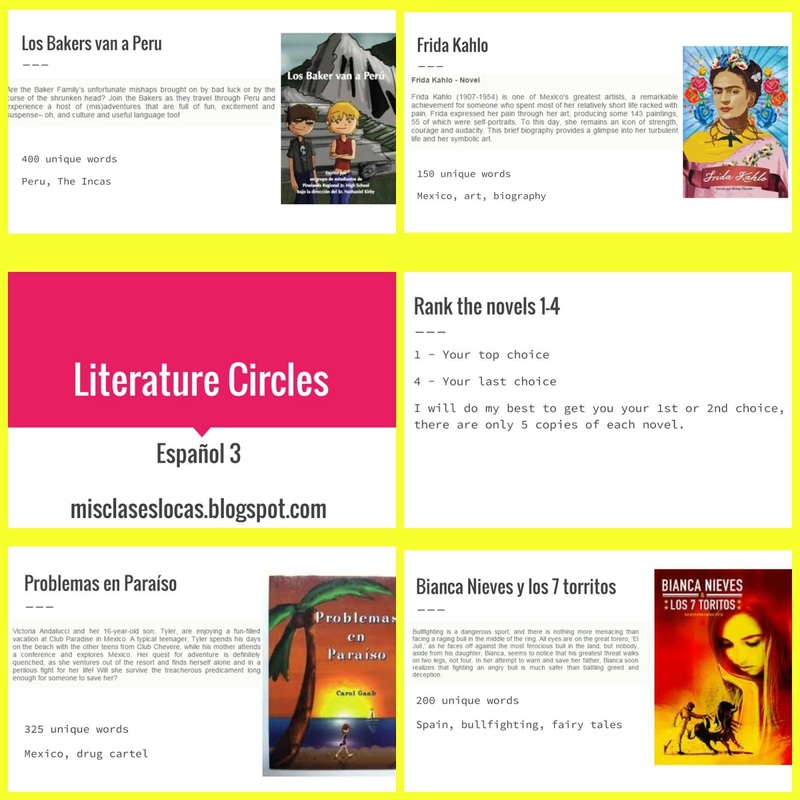 You can find all of my El Internado resources here. Dustin Williamson has some other great exams for the show that were very helpful when putting this together. I started with the same basic character descriptions and character matching for both exams, as well as who said it quotes. There is also a summary of each season, with key vocabulary words missing to fill in using word banks. There are a few pictures as well to describe where they take place, who is included, what is happening, and why this is important to the show. To finish there is a review essay where students give a summary of what happened, how they feel about, how they would change it, who they would recommend it for, and predictions. You can download both versions here. I would have shared it freely, but I did not want answer keys floating around the Internet. For the interpersonal part of their exam, they will discuss, compare and contrast El Internado with the other books they have read this year. To finish the year, Spanish 4 is reading the novel La Calaca Alegre by Carrie Toth. I have only taught the novel once before, with Spanish 4 last year. I have the wonderful teacher's guide and realized that the fist time through last year I must have just been flying by the seat of my pants, pulling questions day by day from the teacher's guide and projecting them. It was my first year with novels and was teaching them in four separate classes at once for the first time, just trying to survive. This year I spent some time putting together a big Google Slide show with chapter by chapter questions and activities. For each chapter I have pre reading, during reading, and post discussion questions included. We do not necessarily discuss every question, but I project them to spark discussion, and the whole slide show is posted on Schoology for absent students. This is especially nice during track season with students leaving early multiple times a week. Students know if they are gone, they should read the next chapter and complete the accompanying questions. This slide show is where I also put links to additional videos, resources, and activities that supplement what we are discussing. It helps to keep me focused and able to pull up the day's plans easily. I find it much easier to plan a whole unit at once, and it ultimately saves a lot of time. Just like last year we started with a discussion on Identity. As I discuss in this post, I used pictures of me in high school to talk about my high school identity, as well as pictures of me now to show how my idea of my identity has changed. Students created a single PicMonkey collage or Google slide using pictures that represent their identity. I projected these collages and each student talked for about a minute in Spanish about their identity through these pictures. 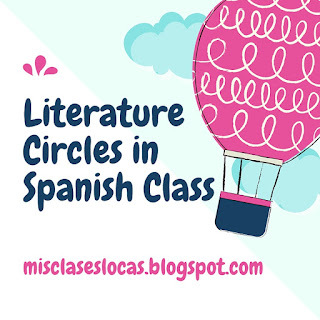 Now that students have done their Literature Circles, they are much more independent readers in Spanish. They read chapter 1 on their own, and then we discussed it as a class. As a review the next day, I projected the chapter 1 word cloud from the teachers guide. Students did a 5 minute free write retelling the first chapter using the world cloud. They shared these at their table and we discussed it as a class. To introduce the vocab we tried out Quizlet Live for the first time with vocab from chapter 2. We used these terms from Darcy Pippens & Christine Clark. The students and I had both never tried it, but it was a great team building way to introduce or review vocab. I read the chapter to the class, discussing questions as we went. Students read the chapter in groups and then we discussed it as a class. To review the next day, students put 10 events from the chapter in order using the manipulatives from the teacher's guide. We also did a reader's theater, acting out the restaurant and car scenes from the teacher's guide. Students love the chance to dig into the prop box. We used the food slide show to talk about Mexican food. Students read the chapter alone and then we discussed it as a class. Individually, student retold the night Angelica disappeared, using the word cloud from the teacher's guide. Students completed a chapter quiz informally together to see their comprehension so far. We read and discussed the chapter. Most of the small class decided to sit together and take turns reading out loud. A few others chose to read alone. The class got to chose either a chapter 5 quizlet or chapter 5 Kahoot to review. We discussed the mural Gulliver by Hector Duarte. We watched the Duarte Interview, while students followed along with the transcript (all provided in the teacher's guide). They worked together to answer comprehension questions from the interview. 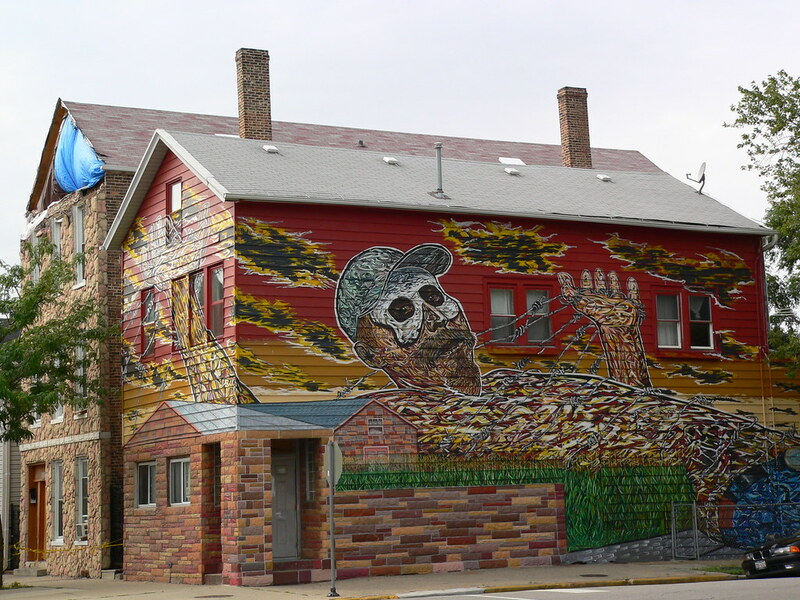 Students also read through the murals of Pilsen slideshow. I plan to continue with this series as we read with posts on chapters 6-10 & 11-15. Here are all posts with the label La Calaca Alegre. 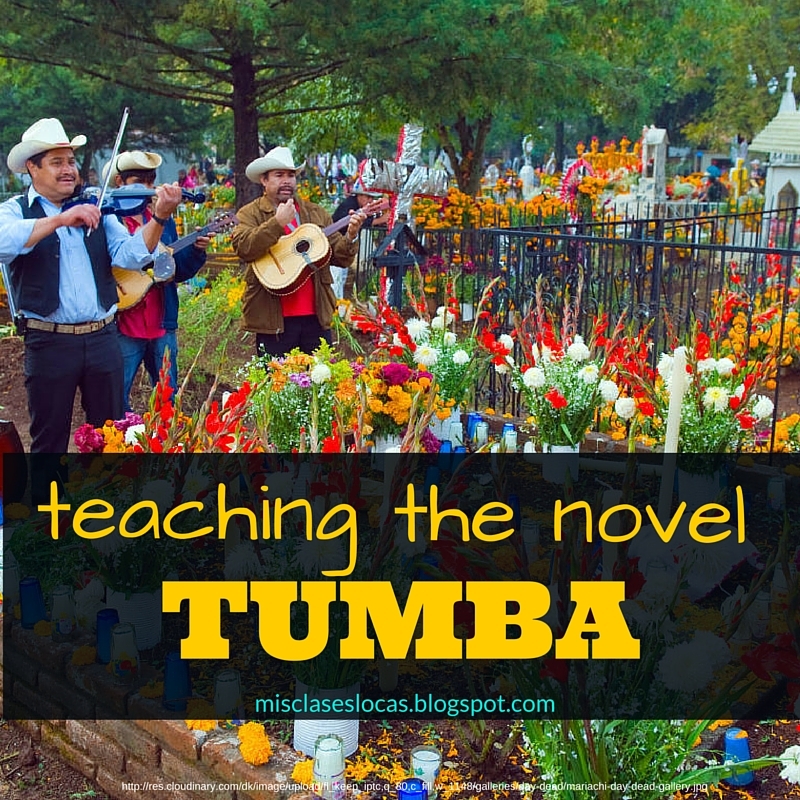 As a part of my Spanish 1 expansion Culture & Civilization class, we are reading Tumba by Mira Canion. It is now my third time teaching the novel, and it gets better each time. My first time with the book I posted each chapter with ideas. You can see them all with the label Tumba. I am including links to the original plans, along with what did this time. We have 60 minute classes and typically did 1 chapter with expansion activities per day. For more ideas, here are all posts with the label Day of the Dead. As you may have seen on social media, Iowa is officially going to have a conference this summer specifically geared for comprehensible input strategies. I am very excited for this opportunity to learn and grow so close to home. It will be on Saturday, June 18 in Nevada, Iowa. There will be tracks for beginner, experienced CI teachers, as well as edcamp style sessions. Check out the Comprehensible Iowa website for for information. I will be presenting a session on Teaching a Novel 101. I would love YOUR feedback of what you would want included in my session. Please comment with what you would want to be included in a session like this! You should register here for this great one day event. There will be TWO keynote presentations: Carol Gaab (author & founder of TPRS Publishing) and Grant Boulanger (CSCTFL teacher of the year). If you are in the middle of the U.S., this is the event of the summer to be at. Get your PD requests in now & I hope to see you there! My first year teaching I went out of my comfort zone and applied for my first grant to start my classroom library. Like many of you I had $0/year budget and everything for my classroom was going to come out of my pocket unless I figured out some other kind of funding. My local education grant was approved and I received almost $1000 to start my Spanish classroom library. I was hooked and realized all I had to do was apply. 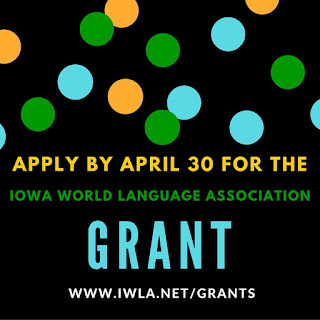 I then applied for two more grants this education grant in my area & the IWLA grant for language teachers in Iowa. They were for building my Spanish classroom library, as well as purchasing class sets of novels with teachers guides. I received them both! Now I am not an expert in grant writing, and even though I started out 3/3, my next one was rejected. I have had a few people ask for advice, so here are my tops tips for writing and receiving money to fund your classroom. I have figured out the secret is just to apply! I know one year the local education grant had only 48 applicants and ended up funding 36 projects worth a total of $30,000. For some grants the money goes unused because there are not enough worth applicants. So just like you tell your high school seniors with scholarships, the money is out there just waiting for you! To find grants to apply to, fire up your Google, talk to your administration, and look to professional and local education and language groups you belong to. Do you know of a grant? Please share the link in the comments!! Just like we tell our students, make sure you carefully read the directions, use any given rubrics, proofread, and submit early. You do not want to be immediately discarded for unprofessional writing (never use contractions in professional writing!) dumb errors, or not following the directions. If you are given a rubric in advance, use that to your advantage to make sure that your project perfectly fits the given criteria. Prepare some killer grants by selling yourself by aligning to your district's goals and using professional literature. My grants have always been literacy based, and every district has literacy goals that your reading project can hopefully help support. Also, use the professional literature for studies showing examples of the importance of second language acquisition. Here is my plug for our Iowa World Language Association grant. If you are a language teacher in Iowa you need to apply! There are up to two grants just for Iowa language teachers. The deadline for applications is April 30, so get it in soon. Forms, instructions, rubric, and submission details are all found here. There is also a separate grant for elementary language programs in Iowa as well with the same due date. Want more ideas? See all of my posts with the label grant. I have never personally tried this but I know of teachers with success in crowd sourcing sites such as www.gofundme.com & www.donorschoose.org. I am not a fan of fundraising myself, but many times celebrities and businesses go on these sites and mass fund for tax write offs. It never hurts to try! 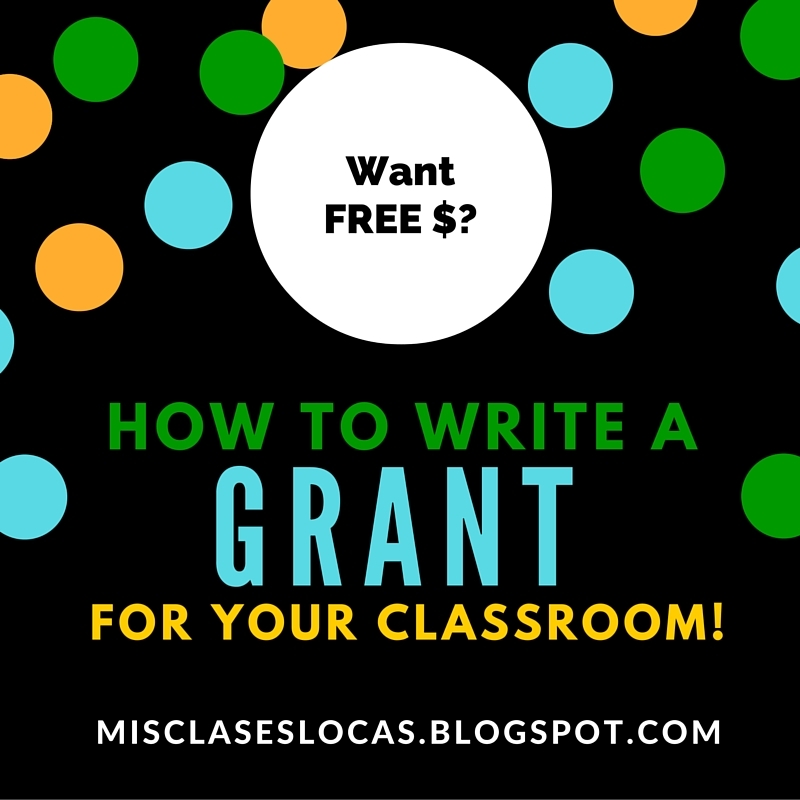 Do you know of a grant that language teachers should know about? Please share the link in the comments!! This week I had the pleasure of having my first ever student teacher. It was for more of a "practicum" as some people call it or in our local university lingo "level 3," the last level before a full semester of student teaching. It. WAS. AWESOME. I have been impatiently waiting for the opportunity to host a university student for the past years, as you can not have one until you have your standard Iowa teaching license. Except I used to think I wanted a student to be able to help me out. Boy was I missing the whole point. Having a university student in your classroom is not just so they can complete menial tasks for you, or teach so you do not have to. Having a university student is an opportunity to be a mentor, co-teacher, and coach. It is a chance to have a collaborative partner to share ideas and immediately reflect on both their teaching as well as your own. In a language class it gives you another speaker of the target language to model conversations, and personalized questioning and answering. It means as a team you can plan to go back and forth taking the lead, and being the assistant who circulates the room providing proximity and student assistance. After just one week together she gave me the sweetest thank you card, which really reminded me what I do what I do. I TEACH. But, this week I got to teach more than just students, and it was more rewarding than I ever though possible. So, if you are ever asked about mentoring future teachers. DO IT. Will you actually have all of this extra time since they are doing everything for you? No, not if you are really focusing on coaching, reflecting, and working with your student teacher. Will it be worth it? YES.